you did a beautiful card. Congrats again on your beautiful Daughter! I'm thankful for my healthy family! I am grateful for so many things that it's hard to choose just one. But I'm most thankful that as a believer in Christ, I am Saved. These cards are so sweet Lucy! Great design and wonderful colours. If I win I’d like to donate to the Crohn’s Disease Organization!! THANKS for the chance to help!! Wow.. what beautiful cards. Tku for the opportunity to win some $s for my favorite charity... St Jude! I am thankful for my family and the blessings that they bring into my life. Beautiful cards, Lucy! I love the stitching that you added--a signature of yours for sure! And the pink card is gorgeous and again---so pink and so you:) I'm thankful for this hobby as I got to know amazing card makers like you! Gorgeous cards! I love the bright pink one! I am most thankful for my husband who has provided continuous support in encouraging me to achieve my dreams. I love both of your cards. I always love the way you do your cards, clean, crisp and simple. Im grateful for my family most of all as they keep me going. Im working overseas and at times I miss them but with today's technology, its easier to keep in touch and communicate. Such beautiful cards. I'm most grateful that in our family we are most of the time healthy and happy. And that I have two wonderful kids and a wonderful hubby. I am thankful for so many things in life! First of all, for my Lord who gets us through this earth each day and in the end will take us to Heaven if we are found faithful! Also, for my husband of 11 years and counting and my two wonderful children! Thanks for your very cute cards today! I am grateful for my family and my faith. Those are awesome cards, love the pink one. I'm so thankful for this last year too. It has had many changes that I didn't think I could make it through but with Gods strength and grace we came out better on the other side. Lovely cards! Love all that pink! I'm thankful for my creativity, it brings me tons of joy. Love the colors and that big flower on the first one ...wow! Watching my parents age and deal with health problems is sometimes a struggle. I am thankful that they are still with me and cherish the time together. I'm most grateful for family. I have a great husband and 2 boys...they fill my heart with love and laughter. And, above all, I'm grateful to God for giving me these blessings. I am grateful for God's Many blessings including a great husband and two crazy adorable boys! I am grateful for having a good job and great friends and family. Beautiful cards! Wonderful cards! I am most grateful for my family--husband, 4 boys, 2 daughter-in-laws and 4 fantastic grandchildren! Wonderful stitching on both your cards Lucy! I am most gradeful for the good Health of my family! As always, your cards are absolutely GORGEOUS! Thank you so much for your inspiration! Aside from my family, I am grateful for all the wonderful friendships that I've been blessed with! Beautiful cards! Love your CAS style! My favorite is the first one, love that flower! Wonderful cards Lucy. I´m most grateful for my loving family and we can all be together very often. Beautiful cards--love them both! I am so thankful for my wonderful family, I'm so blessed to have them. Gorgeous cards that certainly brightened my day. I'm grateful for my family (wish they lived closer), and my amazing husband. Thank you for sharing and inspiring. Lucy your two cards are so beautifully done. I love them both. My two girls & my husband are what I am so grateful for. Love my little family. I'm also grateful to my online blogging buddies. Gorgeous cards, Lucy! You are the paper-piecing queen! Amazing! I love how fun the pink card is too! Very pretty cards and, yes, I love that pink ribbon! I am most grateful for my wonderful husband but I have SO much to be thankful for. Love your cards. They are beautiful! If I have to name one thing I am most greateful for it would have to be my wonderful family!!! what a lovely card. I am grateful that I had 46 years married to my wonderful husband before he passed away a short 5 weeks ago. Daughters are a wonderful blessing! I am grateful for my husband, daughter and good friends! Your cards are beautiful! I'm very thankful for my family. Oh how I love that pink card!!! And the ribbon is to die for~~! I am grateful for my 5 year old beautiful daughter, my job and the roof over our heads. I love your cards! That pink is fab. I am so grateful for my family. I am the oldest of nine, so my family is quite large. We lost our mom in June, so I'm so thankful we will be together to get through the holidays. Lovely cards! I'm so very grateful for my wonderful husband! Your cards are both phenomenal!! 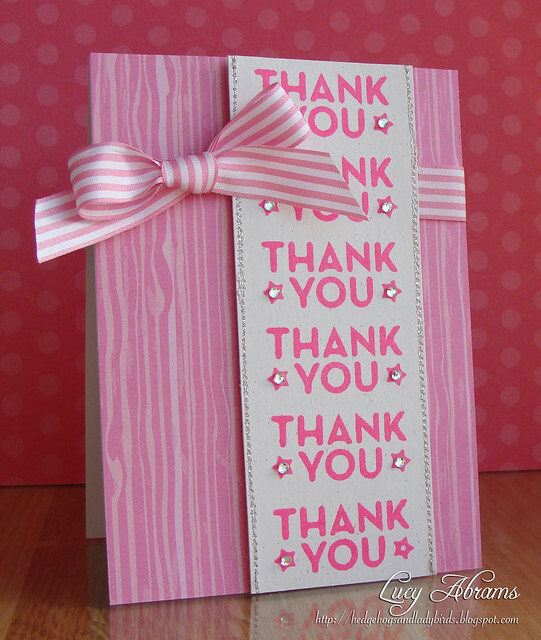 I love that pink striped ribbon and how perfectly it matches the cardstock! I love the stitching on your first card with those pretty blues too! Beautiful cards!!! I am grateful for all the support from family, friends and especially new friends that have helped me through this difficult year. Wonderful cards! I am grateful for my faith and my family. Love the fun girly pink card! I'm most grateful for all my family and friends and that it's been a healthy and happy year for everyone. Fantastic theme for this blog hop. I'm grateful for lifelong friends. Lovely cards! I like your clean style. I'm thankful that I always have enough to eat and never have to worry about having a roof over my head. I love your cards. Thanks you for sharing your talents! I am really grateful for the love of my family. I am really grateful for the love of my family and friends. Beautiful cards, Lucy! I'm grateful for faith, freedom, and family! I am grateful for my salvation and fun healthy family! I am definitely grateful for family and friends, but also for bloggers like all of you who share their ideas and knowledge so freely! Thank you! Your cards are beautiful! Each so different—both striking! I'm most grateful for my loving family. Beautiful cards! I'm thankful my parents are in good health. Such cute cards, love the brilliant colors! I am grateful to be able to spend more time with my elderly horse, Jordan. I am grateful for. my church family. they have brought me so much joy and comfort over the last year. I am most thankful this year that we became foster parents to our cousins 13 year old daughter and that our home will be her forever home! Love both cards and your stitching is amazing! I am grateful that I have a healthy family and able to enjoy this cardmaking hobby! Your cards are clean lined, colorful And beautiful. The transmission went out on my vehicle this Saturday. I didn't know what we were going to do. Its older and found out it was just going to be just too costly too fix. My hubby was going to have to work 6 days this week so we weren't going to be able to get anything else and I was afraid I was going to have to quit my new job. I'M thankful for my husbands boss that let him off work yesterday. I'm thankful for the car dealer that got us approved for a loan (even though we have bad credit) and with a payment we can afford. I'm thankful for my husband for picking out the perfect vehicle for me...even though I was at work. I'm thankful that my problems are small compared to a neighbor who has to remodel her house because the floors are giving out...has no insulation...handicapped child...and a vehicle that can only be driven a few minutes and then has to cool down for hours before it can be driven again. I'm grateful for Good who gives us 2nd 3rd and 4th chances...happy Thanksgiving everyone! I am thankful for my faith and family and friends and all the many blessings I have been graced with! God bless! Lovely cards, I especially like the blue one. Happy Thanksgiving! Thanks for sharing! I am so grateful for the people who have touched my life and made it richer. Beautiful cards! I am most thankful that God loved us enough to make a way for us to be His forever, in spite of our failures, giving freely of His mercy & grace!! I am grateful for a wonderful husband, a happy family and a new job that starts on Monday. I'd love the chance to give a donation from Simon Says to my favorite charity, the Relay for Life. We hold two crops each year to raise money for the Relay. I'm always grateful for family and friends. Your cards are terrific. Thanks so much for participating in the blog hop. I have so much I am grateful for, but most importantly, my friends, my family, my job and my home. Blessings to all. Pretty card. I'm most grateful for health, spiritually, physically, and mentally. Like the first Pilgrims, I'm grateful for the Lord's protection and provision throughout the year, especially during Hurricane Sandy. I'm grateful for all the wonderful ideas that all the artists provide. Thanks. Love both the cards. Like the bright cheery colors! Your cards are lovely and I'm so excited about the fantastic prize (giving a lot of thought to which charity I'd send the money to!) I'm grateful for the love and good health of my family and friends! This is the time of year when I feel it the most and have the most fun creating, visiting and sharing with them! Thanks so much for your generosity!!! Lovely cards! I'm not a 'pink' girl but I love your pink card. I'm vary grateful for my family and for a Mission trip to Honduras that I made this year. Thanks for the chance. I'm thankful that no matter how bad things get, God cares! Last night we hit a deer. I told DH we can be thankful the airbags didn't deploy. The damage to the grill and bumper were enough. Your cards are adorable. The bling on the pink one just adds to the neon pink! Beautiful cards...love the repeated sentiment on the pink card. I am most thankful for the patience & resolve my husband has shown this last year. Earlier in the year he experienced a work related injury, injuring his back. Surgery was unsuccessful and he has suffered daily ever since. Still, he doesn't let it get to him. He takes it all in stride, hoping & praying for pain free days. Not sure I could be as strong as him with all that he’s been through. I’m thankful for my strong man. A few weeks ago there were big floods in our country and many people lost everything they had, so in that moments you learn to cherish every little thing you have, because you know there are so many in need out there. So I’m thankful for everyone that helped those who were affected by the disasters, it gave me hope that we can still find unity in these hard times. What a gorgeous pink card. Love the paper and ribbon.